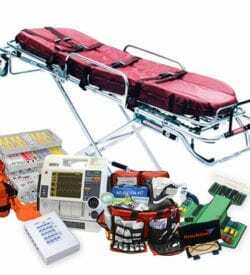 Equip your EMS simulation lab with EMS Simulation Bundles from DiaMedical USA. EMS Simulation Bundles are perfect for successfully integrating simulation into NREMT skills assessments, ACLS and PALS scenarios, and EMS simulation. Choose from three different bundles designed to meet the needs of your BLS or ALS training program. Get everything you need to start a new EMS simulation lab with the EMS Sim Starter Bundle. Expand or enhance your current EMS simulation with an ALS Simulation Bundle or BLS Simulation Bundle. Save time and money with Simulation Bundles from DiaMedical USA!